According to OSHA, the U.S. Occupational Safety and Health Administration, forklifts account for about 100,000 workplace accidents per year. Roughly one-third of these incidents cause serious injuries. If you’ve been injured in a forklift accident, it’s vital that you understand how to protect your right to workers’ compensation benefits. Forklifts are heavier in the rear to account for the weight of what’s being carried in the fork. 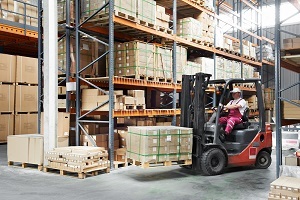 Cars have brakes on all four wheels, but forklifts generally only can brake with the front drive wheels. Forklifts have smaller turning radiuses than cars because you must turn by moving the rear wheels. Accidents can cause injuries to the person driving the forklift as well as to others who are working in the area nearby. Lack of training in how to safely operate a forklift. Working conditions where speed and stress cause errors. Poorly designed workplaces, such as narrow aisles and obstructions at intersections. Improper backing up, turning, or accelerating. Failing to choke or secure the forklift when it’s not in use. Since workers’ compensation does not take fault into consideration, you can still receive benefits even if the accident was caused by your own error. The only exceptions to this no-fault rule are accidents caused by horseplay or operating a forklift while under the influence of drugs or alcohol. Georgia law grants workers’ compensation benefits to most part-time, full-time, temporary, and seasonal workers on their first day of employment as long as their employer regularly has three or more employees. Medical benefits to pay for emergency care, diagnostic tests, surgery, physical therapy, medications, and other related expenses. Permanent Partial Disability (PPD) benefits to compensate for the permanent loss of function in a specific part of the body or the body as a whole due to a workplace injury. In cases involving fatal workplace accidents, death benefits are available to the surviving spouse, children, or other financially dependent individuals. These benefits are used to pay for funeral and burial costs as well as to compensate for the deceased person’s loss of income to pay for necessary household expenses. In most cases, workers’ compensation is the exclusive remedy for on-the-job injuries. However, some forklift accidents may form the basis of a valid third-party claim. Third-party claims are civil claims for damages filed against someone other than your employer. For example, if you are injured on a construction site, and the forklift driver is employed by a different contractor than your employer, you may be able to maintain a claim against the driver's company. Or, you may have a products liability claim if your injuries were caused by some sort of mechanical defect in the forklift. It is also possible to bring a premises liability claim if you were hurt while working for your employer on land owned by someone else. When you’ve suffered a work-related injury, the best way to protect your right to benefits is to retain the services of an experienced attorney. The legal team at Rechtman & Spevak is committed to protecting the rights of injured Georgia workers. Call today to schedule a free, no-obligation initial case review.